Christmas in Alsace is truly magical. This is the region which has had a large influence over Christmas celebrations in France. 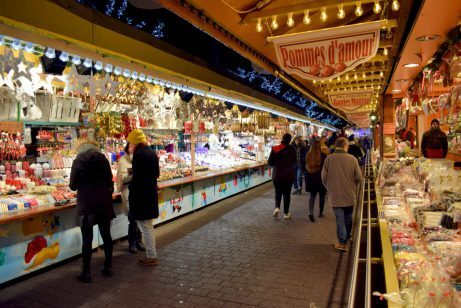 The Christmas market is a long standing tradition there, and the proximity of Germany gives a ‘germanic touch’ that is much appreciated in France. The setting is perfect: old half-timbered houses richly decorated, an abundance of fairy lights, classical concerts in local churches, good food and Christmas cookies and gingerbread, all combine to offer an unforgettable magical experience, which when it snows gives the most traditional Christmas atmosphere! Known, respected or feared since medieval times, the three main characters of Christmas in Alsace are Saint-Nicolas, Hans Trapp and Christkindel. The benevolent figure of Saint-Nicolas is celebrated on the 6th December. A rather austere foreign bishop, Saint-Nicolas quizzes the children on their behaviour before handing over a basket full of treats and toys. Find out more about Saint-Nicolas. The terrible bogeyman is portrayed with a blackened face, wears a long beard and is dressed in a bearskin. His rod threatens the children, particularly the naughty ones, who can only count on the goodness of Christkindel. In neighbouring Germany, this sinister assistant of Saint-Nicolas is known as Knecht Ruprecht and as Père Fouettard in Lorraine. According to the legend, Hans Trapp was a 15th century knight whose real name was Hans von Trotha. The warmonger had a long fight with the abbey of Wissembourg. He resided in his castle of Berwarstein which is today situated in the southern part of the Palatinate Forest in the state Rhineland-Palatinate (Germany). The war led to his excommunication by decision of the Pope and Emperor Maximilian I had him banned from the Roman German Empire in 1496. When the Reformation extended across the region of Alsace, the Protestant community replaced the catholic figure of Saint-Nicolas by another gift bringer: Christkindel. Consequently the date of giving presents was changed from 6 December to 25 December. The angelic figure is represented by a young maiden whose face is whitened with flour. She wears a crown of gilt paper with lighted candles in it. 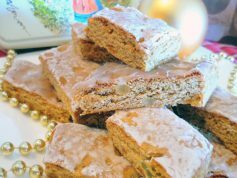 Her hands carries a silver bell and a basket of sweetmeats: apples, gingerbread and nuts that she will give to the well-behaved children. 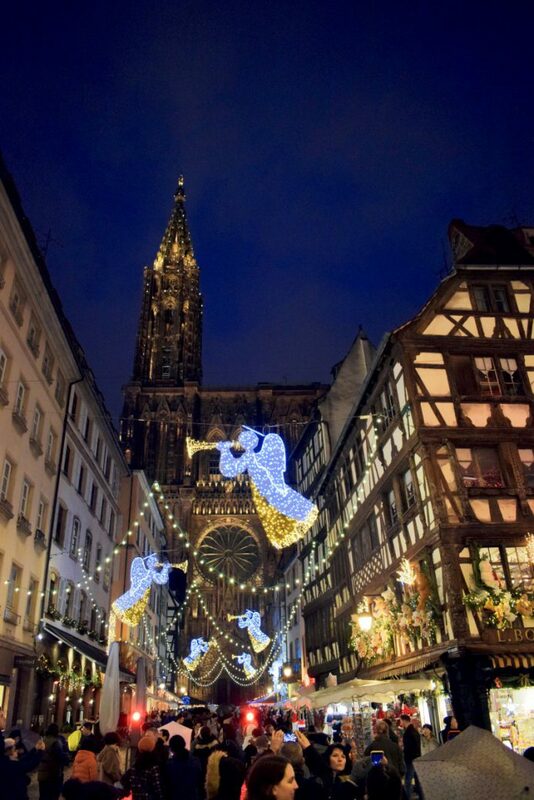 The Christmas market of Strasbourg, originally known as the Saint-Nicolas’ fair, was renamed after the angelic gift-bringer (Christkindelsmärik) in the 16th century at the time of the Reformation. The Christmas tree was born in Alsace! 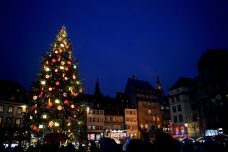 There is now a consensus within the international society: the Christmas tree was born in Alsace, in the little town of Sélestat, between Colmar and Strasbourg. It proves once again that Christmas is definitively a highlight in the region. The first Alsatian Christmas trees were decorated with red apples (symbol of temptation) and cookies resembling ‘hosts’ (symbol of redemption). In the second half of the 16th century, the Reformation leaders refused to use a Nativity scene during Christmas and encouraged the development of the Tree tradition as it does not depict Jesus and biblical characters. This explained why the Christmas tree quickly spread throughout Northern European states, of protestant faith, such as Northern Germany and Scandinavia. Let’s keep in mind that in the 16th century, Alsace was entirely part of the Germanic world, as were the neighbouring duchies of Lorraine and Austria. The tradition of putting up a decorated fir tree on Christmas Eve was kept alive throughout the 17th and 18th centuries, while in France it never really broke through. This would all change when Maria Leszczyńska, the wife of King Louis XV from Poland, brought the tradition to Versailles with very little success. But in the 1830s, the German daughter-in-law of King Louis-Philippe, Duchess Helen Louise of Mecklenburg-Schwerin, set up a Christmas tree into the Tuileries Palace, but it still did not become a strong tradition among the population in France. It was from the Franco-Prussian war (1870-71) that the Tree started to become popular in the country. This was due to the flock of immigrants fleeing from Lorraine and Alsace, therefore refusing to become Prussian. They brought with them the Germanic tradition of the tree and by the 1930s, the Tree became part of the celebrations in every French household at Christmas. England also had to wait until the early 1840’s to see the tradition established in their country. It was Prince Albert, of German descent, who was said to have put up a Christmas tree in Windsor Castle. Read more about the French tradition of Christmas tree and Christmas decoration. The Strasbourg Christmas market is a vast outdoor public space spreads all over the Old Town which sells anything to do with Christmas. It is locally called Christkindelsmärik (Marché de l’Enfant Jésus) and is one of the oldest in Europe. Strasbourg’s Christmas market is the oldest in France, dating back to 1570, at a time when the Alsatian capital was not even French. In Alsace, it is locally known as the “Christkindelsmärik”, and takes place in the Old Town. Read more about Strasbourg Christmas market. Other renowned Christmas markets are those of Sélestat, Colmar, Eguisheim, Kaysersberg, Mulhouse and Riquewihr. Most of Alsace’s little towns and villages hold markets of this sort, competing with each other for the best illuminations and Christmas atmosphere. The streets are adorned with sparkling decorations, animated facades, and illuminated monuments. Pretty little wooden stalls (called châlets) are set up in the centre of most Alsatian towns are individually decorated and illuminated to spread the enchanting atmosphere of Christmas in Alsace. Alsatian Christmas markets often takes place in the main square or street of a town, and is organised by the local council. It officially starts on the first weekend of the Advent that is 4 Sundays before the 25th December. 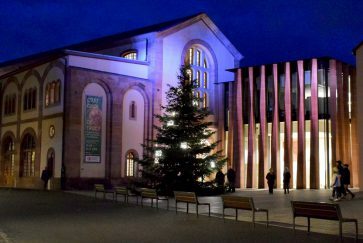 A true Alsatian Christmas market displays the Christmas nativity scene and has a majestic illuminated Christmas tree in its centre. The fine aromas of mulled wine (with scents of cinnamon, orange and spices) and roasted chestnuts perfume the atmosphere. The craftsmen in the chalets offer authentic goods especially for the Christmas season: decorations for the Christmas tree, pottery decorations, blown glass, toys and chiselled wooden Christmas figures for the nativity, linen, floral art, and hampers containing foie gras, Christmas biscuits and gingerbreads. Hugely popular, the Christmas markets of the villages along the Alsace Wine Route can become congested with the flow of visitors on weekends in December – you had better come armed with patience! 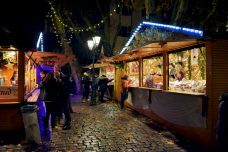 Read more about Christmas markets in Alsace. Most of the towns in Alsace have the streets of their historic centre richly decorated and lit up for Christmas. Some of the beautiful old façades show a fantastic display of Christmas decoration. It has become a tradition for Alsatians to have a stroll at night fall along the enchanting streets of their towns. Many towns and villages organise a Saint-Nicolas parade or at least the coming of the Patron Saint in schools. Other events include the coming of Saint-Nicolas and the little parade of the Christmas tree in the streets of the old town, story-telling and Christmas decoration workshops for children. The town of Sélestat run a little parade of the Christmas tree along the streets of its historic centre. The Midnight Mass is a dear tradition followed by many Alsatians. On Christmas Eve, the traditional Christmas Mass is held in one of the beautiful churches of the region such as in Strasbourg Cathedral. In the little town of Thann (Haut-Rhin), Santa climbs down the bell tower of the Collegiate and gives away sweets to the children. Called “Le Père Noël escaladeur“, this is the only place in Alsace where Santa abseils from the top of a church accompanied by his elves. Read more about Christmas in Thann. In Guebwiller (Haut-Rhin), an original yet creative event called « Blue Christmas » distinguishes the town from the popular Alsatian destinations that are Colmar and Strasbourg. 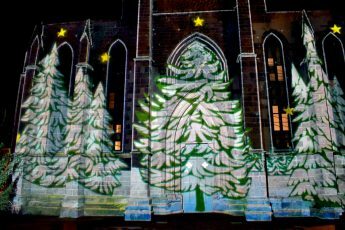 Mixing traditional Christmas illuminations with mapping video (projections on buildings and monuments), the Noël Bleu in Guebwiller aims to emphasise the rich architectural heritage of the town. Read more about Christmas in Guebwiller. To the North of Alsace, on the border between France and Germany in northern Alsace, lies the little town of Wissembourg where two legendary characters of Christmas appear at nightfall: the sinister Hans Trapp and the graceful Christkindel. Wissembourg belongs to the land of Christmas mysteries, one of the seven lands of Christmas covering the Alsace region. Just before Christmas, a night parade with torches is organised in the streets of the old town of Wissembourg where Hans Trapp makes a dramatic and loud entrance with his companions, the robber knights. Distraught monks precede them, alerting the inhabitants of their coming. Fortunately, Christkindel arrives in her bright float to pull back the forces of darkness. Lights, rolls of drums, costumed actors, handing out of treats… this unique event attracts thousands of visitors and ends with a firework display. After Christmas, it is tradition to walk from Wissembourg to the Berwarstein Castle in Germany which used to belong to the robber baron. The traditional 16 km long walk, locally called “marche du Hans Trapp”, is organised by the Tourist Centre of Wissembourg and ends with a medieval meal in the castle’s knight room. 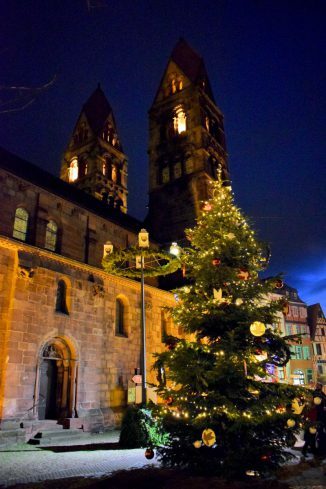 In addition, Wissembourg hosts its own Christmas market located along the St. Pierre and Paul Abbatial Church. In the little town of Altkirch in the Sundgau there are no Christmas market organised. 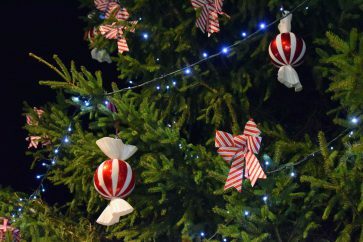 Instead, the Enchanted Forest serves the town right with fir trees spreading out throughout the old town centre, creating a fantastic world of ancient local tales and legends. Read more about Christmas in Altkirch. 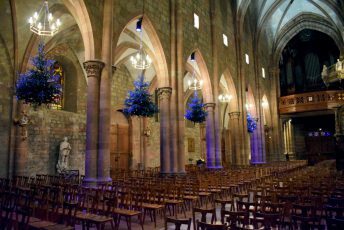 A number of concerts and musical events known as “Les Noëlies” are organised throughout the region: choirs, brass bands, Alpine horn players, Carols… some of them are hold in public squares or in churches. A few towns (Altkirch, Colmar, Obernai, Saverne) have a temporary ice-skating rink set up right in the centre of town during Advent. In Mulhouse, a 30 metre-high Ferris Wheel overlooks the Christmas market and the main monuments and buildings of Place de la Réunion. These additional entertaining structures contribute to the festive atmosphere of Christmas but do not represent traditional elements of Christmas in Alsace. The region of Alsace benefits from a rich gastronomy which is much appreciated during the Holiday season. 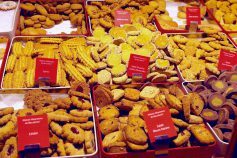 From Foie Gras to Kugelhopf, gingerbread and little Christmas cookies, the Alsatian gastronomic traditions will enchant young and old alike on their visit to one of the many Christmas markets taking place throughout the region. 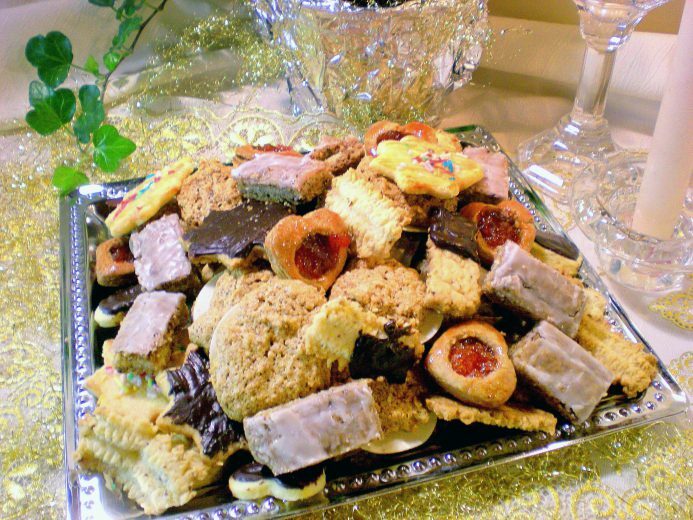 Local dish and desserts include: foie gras, stuffed goose, christolle, gingerbread, linzer torte, mannele, kugelhopf, bredalas, without forgetting the Alsace Wines, mulled wine and Christmas beers. 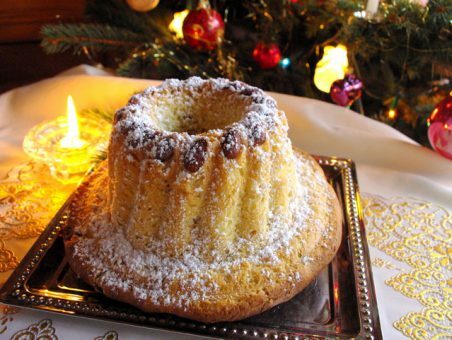 Read more about the Christmas gastronomy of Alsace.